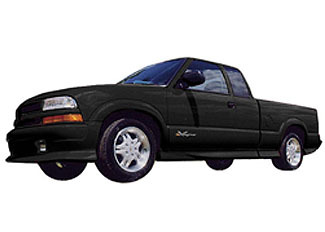 Turn heads with this Chevy S-10 Ground Effects Package. A special sports suspension package gives it a low aerodynamic stance while ground effects are perfectly complemented with custom fog lamps. Designed for two-wheel-drive vehicles without the YC5 trim package, the package includes flares, rocker moldings and rear outer extensions. Towing is prohibited and fascia and starter heat shield are required. Ground Effects Package parts are also sold separately.